Another example of how the mighty have fallen, Todd Edwards blazed incredibly bright in the early nineties, more or less invented speed garage by accident, milked it as long as he could and continued making the same music way after all his inspiration had left him. Instead of cleverly cutting, pasting and tone-shifting micro-samples, he started lazily filling in any obvious holes with vocodered lines sung by himself (and he doesn't have a great voice). Increasingly embarrassing and incongruous references to God and Jesus were shoehorned into his remixes. The beats got faster and faster, a sure sign that the melodies were getting weaker and weaker. Frankly, he hasn't done a decent remix in the last eight years. And yet, back in the early nineties, no-one could touch him. What seemed like a formula - dry beats, chopped up vocal samples, that break - was endlessly inventive, surprising, inspiring. 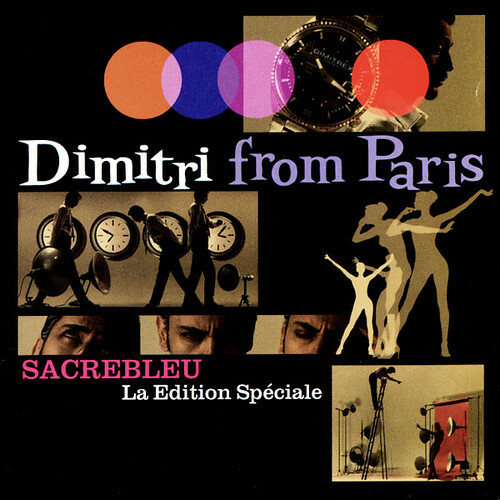 When Dimitri From Paris' Sacrebleu album was re-released in the U.S. through Atlantic, they commissioned new American mixes of a few tracks to whip up some interest. Une Very Stylish Fille was picked up by Volvo for an ad campaign and remixed by both Kenny Dope and Steinski. Sacré Français got new mixes from Davidson Ospina and Todd Edwards, and the latter were absolutely top notch. Unfortunately, the Todd Edwards Re-Dub version on the CD was mixed in with the previous track (because of its long intro?) and the alternative Re-Create Mix was never released on CD. Indeed, the entire album is now no longer available, almost certainly because of problems with uncleared samples. Happily, I recently across an old CD-R of mine from many years back (when I had access to a Technics and proper amplifier) packed full of classic Todd Edwards remixes! Below you'll find the link to the two Dimitri remixes. Firstly, I've reconstructed the Re-Dub version to remove the mixed intro that was on the CD. This involved re-creating the rhythm beat by beat, high hat by high hat. During the process I also came across a click in one of the samples that was almost certainly left in purposefully, but I found very distracting, so I've removed it throughout the track. As for the vinyl-only mix, I've de-clicked it and it sounds pretty damn good. Have a listen! Mantra ft. Lydia Rhodes - Away (Todd Edwards mix) (14MB). This is a stone cold classic, and it's a crying shame that the only digital versions available now are chronically cynical circuit mixes by John Creamer and Stephane K.
Wildchild - Jump To My Beat (Todd Edwards Jump remix) (15MB). Another great remix, released on CD-single but only in a shunted version. This is the full version. Ali - Love Letter (Todd Edwards dub) (13MB). The dub was never released on CD, but it's pretty damn fine. here (13MB) and here (14MB) respectively. I will have to check this re-edit & other tracks too. Thanks for the full version of "Wildchild - Jump To My Beat"
One of my all time Todd Edwards remixes. Did you extend the Wildchild Jump to my Beat remix to 8 minutes, or did Todd do this version himself? If you did it, it's really well done. Great work! I haven't touched the Wildchild. That's the original version that was on the 12" (and shortened for the CD-single).